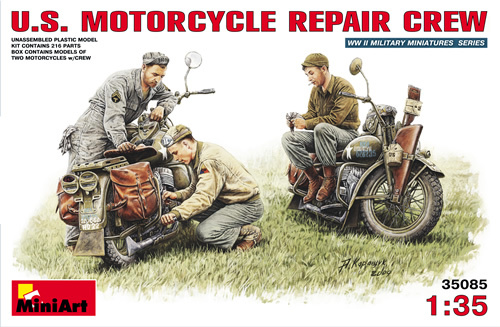 Many G.I.s who were assigned to motorcycles during the war brought home with them their love for these two-wheeled workhorses. Free to ride the open roads of America without risk of enemy fire, they congregated and formed local clubs. Absent the uniforms and weapons, the men in this set could easily be hanging out in a garage or driveway in 1946 or '47, tuning up their engines and getting their hogs ready to eat up some blacktop. Once again, MiniArt's figures are on par with the motorcycles, first offered in the excellent U.S. Motorcycle WLA: sharply detailed and well executed. I particularly like the three different caps these guys wear. The varied uniforms also differentiate the mechanics and they can be used together up through the early fall of 1944, before the canvas leggings were phased out. Also included are a new pair of saddlebags different from those on the duplicate motorcycl sprues, and a scabbard that holds an M1 carbine, a change-up from the usual Tommy gun. The set provides a small sheet of decals, including insignia for the soliers as well as instrument dials, placards, and markings for the bikes. The only thing that is missing from this set is a tool box and some photo-etched pliers, wrenches, screwdrivers, gaskets, and chains. Nonetheless, you won't find a better way to start to fill your motor pool!